The Australian Government’s Regulator Performance Framework has established a common set of six key performance indicators that allow for the assessment of Commonwealth regulators’ performance in minimising the burden imposed on business in administering regulation. The ACCC conducted a self-assessment against the framework’s key performance indicators at the conclusion of 2017-18. The results of this assessment are outlined in the 2017-18 ACCC Regulator Performance Framework self-assessment report. 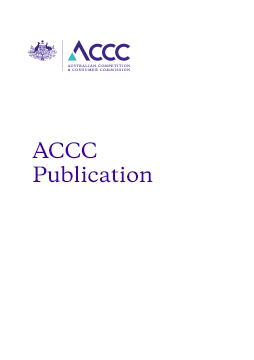 The direct views of businesses were sought through the 2018 ACCC business stakeholder survey to assist the ACCC in undertaking the self-assessment.